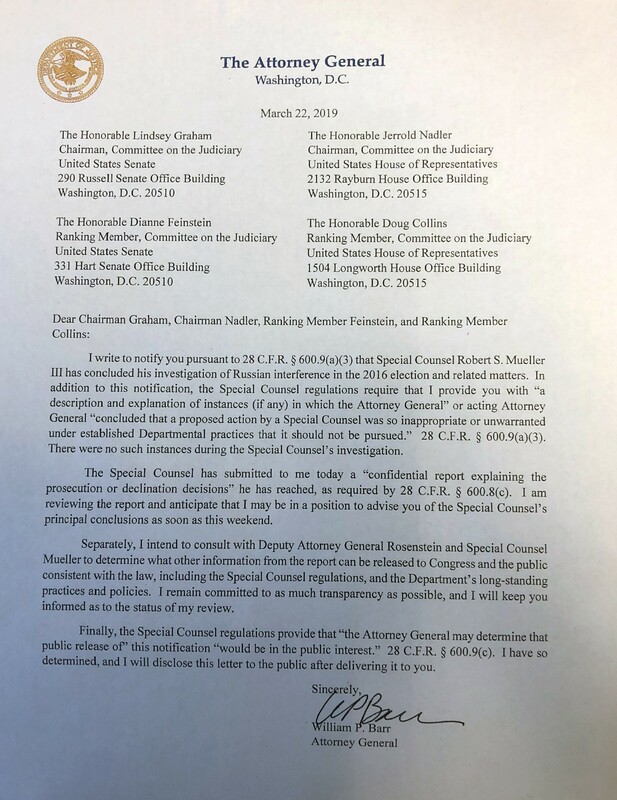 The letter that William Barr, the attorney general, sent to Congress informing them of the receipt of Robert Mueller's report. WASHINGTON — Special counsel Robert Mueller has delivered a report on his inquiry into Russian interference in the 2016 election to Attorney General William Barr, according to the Justice Department, bringing to a close an investigation that has consumed the nation and cast a shadow over President Donald Trump for nearly two years. Barr told congressional leaders in a letter Friday that he may brief them within days on the special counsel’s findings. “I may be in a position to advise you of the special counsel’s principal conclusions as soon as this weekend,” he wrote in a letter to the leadership of the House and Senate Judiciary committees. It is up to Barr how much of the report to share with Congress and, by extension, the American public. The House voted unanimously in March on a nonbinding resolution to make public the report’s findings, an indication of the deep support within both parties to air whatever evidence prosecutors uncovered. Barr wrote that he “remained committed to as much transparency as possible and I will keep you informed as to the status of my review." He also said Justice Department officials never had to check Mueller because he proposed an inappropriate or unwarranted investigative step — an action Barr would have been required to report to Congress under the regulations. His statement suggests that Mueller’s inquiry proceeded without political interference. Since Mueller’s appointment in May 2017, his team has focused on how Russian operatives sought to sway the outcome of the 2016 presidential race and whether anyone tied to the Trump campaign, wittingly or unwittingly, cooperated with them. While the inquiry, started months earlier by the FBI, unearthed a far-ranging Russian influence operation, no public evidence has emerged that the president or his aides illegally assisted it. Nonetheless, the damage to Trump and those in his circle has been extensive. A half-dozen former Trump aides have been indicted or convicted of crimes, mostly for lying to federal investigators or Congress. Others remain under investigation in cases that Mueller’s office handed off to federal prosecutors in New York and elsewhere. Dozens of Russian intelligence officers or citizens, along with three Russian companies, were charged in cases that are likely to languish in court because the defendants cannot be extradited to the United States. Mueller looked extensively at whether Trump obstructed justice to protect himself or his associates. But despite months of negotiations, prosecutors were unable to personally interview the president. Even though under current Justice Department policy a sitting president cannot be indicted, Trump’s lawyers worried that his responses in an oral interview could bring political repercussions, including impeachment, or put him in legal jeopardy once he is out of office. Not since Watergate has a special prosecutor’s inquiry so mesmerized the American public. Trump has helped make Mueller a household name, attacking his investigation an average of about twice a day as an unfair, politically motivated attempt to invalidate his election. He never forgave former Attorney General Jeff Sessions for recusing himself from the Russia inquiry, an action that cleared the way for his deputy, Rod J. Rosenstein, to appoint Mueller. Trump reiterated his attacks on the special counsel this week, saying Mueller decided “out of the blue” to write a report, ignoring that regulations require him to do so. But the president also said the report should be made public because of “tens of millions” of Americans would want to know what it contains. Barr told congressional leaders that he would decide what to release after consulting both Mueller and Rosenstein.